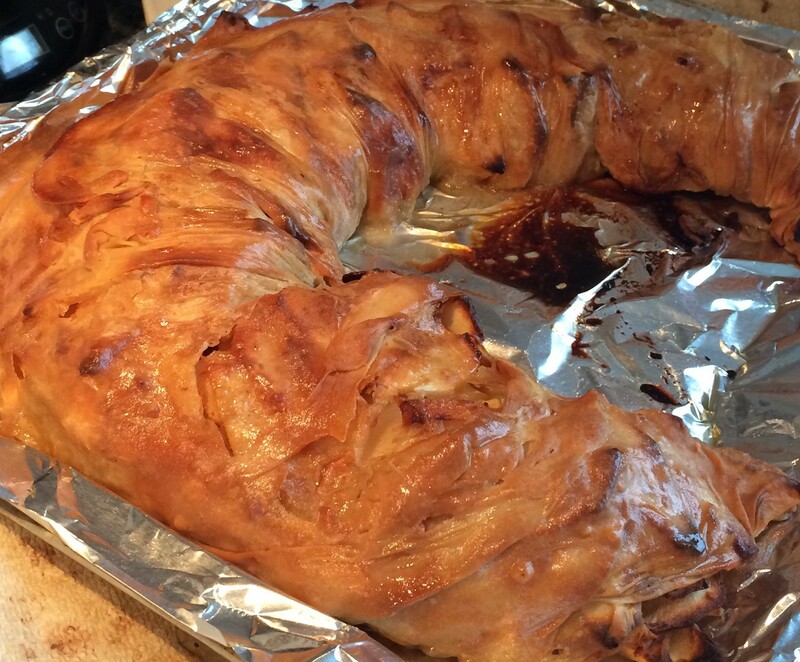 Also known to us Americans as Apple Strudel. A loooong time ago I went to visit my friend Ginnie in Vienna. While I was there I picked up this tiny little cookbook called Austrian Specialties. There are lots of handy recipes in this short 80-page cookbook and it has my go-to recipe for goulash. Most importantly it is in English with mostly American measurements. I’ve always wanted to make it, but it seemed like just So Much Work. I’d never worked with a dough like that; a non-yeast dough that seems like a yeast dough. And you have to get it really thin so that the layers are light and don’t end up being thick and snappy like crackers. And then there is the bushel of apples you have to peel and slice. And the rolling? Insane. But I had time today. H and Mark had gone to yet another dinosaur museum and E was immersed in a book. So, what else am I going to do with my time other than make some kind of insane baked good that no one in their right mind makes anymore. I looked at my handy little cookbook and read through the recipe. Actually…. it seemed kind of doable. Here is the dough recipe. Sift the flour into a bowl. Make a “well” in the flour and put in the egg, oil, and salt. Start to mix it up with a fork and then add your water slowly as you mix together the dough. Stop when the dough becomes a medium-firm ball. It will be very sticky so flour your hands and kneading surface well. 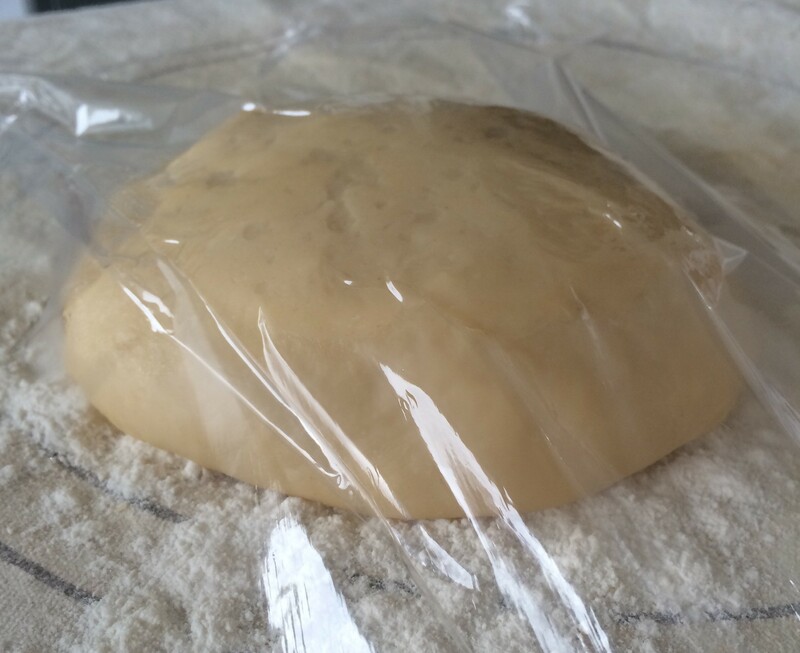 Knead the dough for a good 10 minutes and then let it rest for 30 minutes, covered with plastic wrap. 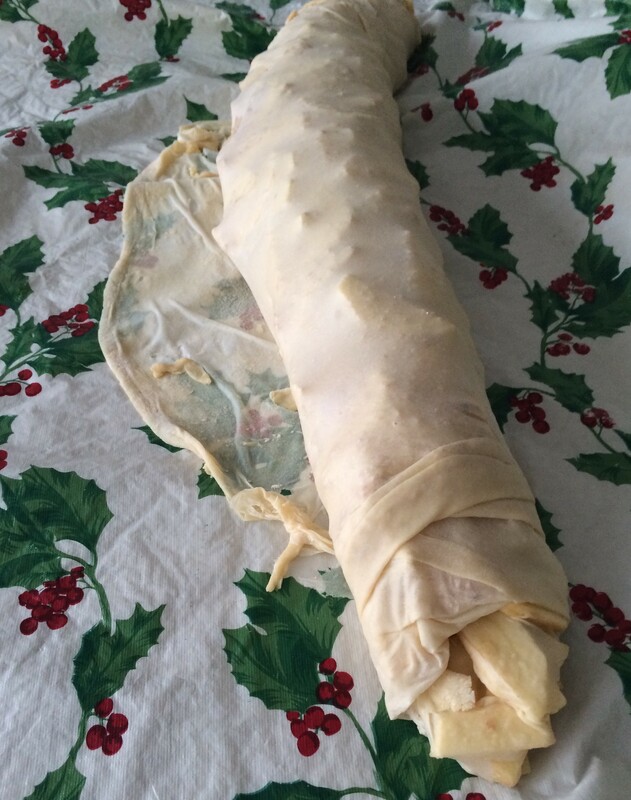 My happy strudel dough, taking its little nap. And just when you think you can sit down with a cuppa and take a load off you have to start cutting up the apples. 3 and half pounds of apples! That is a bucket-load of apples! It took me at least 30 minutes to cut up all those apples. Don’t worry, though. Your dough won’t mind. But before I get too far, here is the recipe for the filling. Some people like raisins in their strudels. I am not one of them, so I skipped this step and just drank the rum. However, if you are one of those people who do, in fact, like raisins in your strudel you will need to soak the raisins in the rum while you cut the apples. 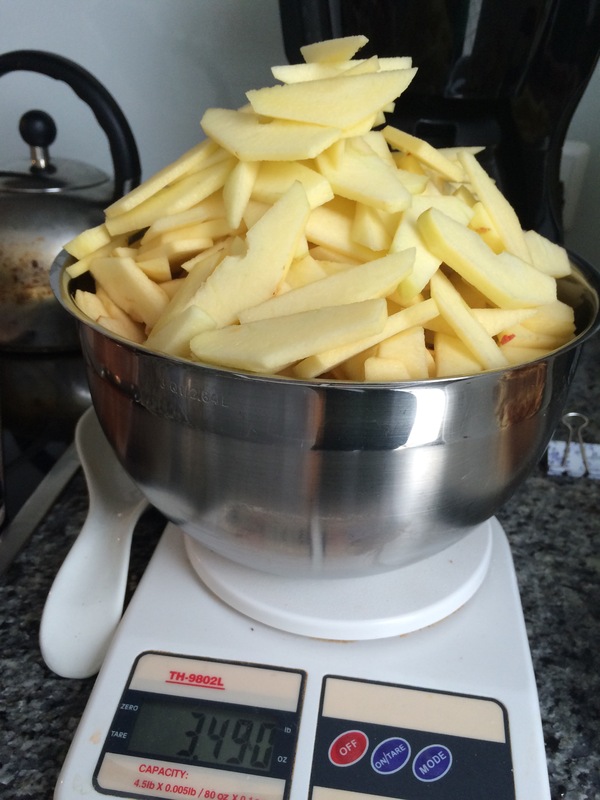 You will need a really big bowl for your apples because this A LOT of apples. 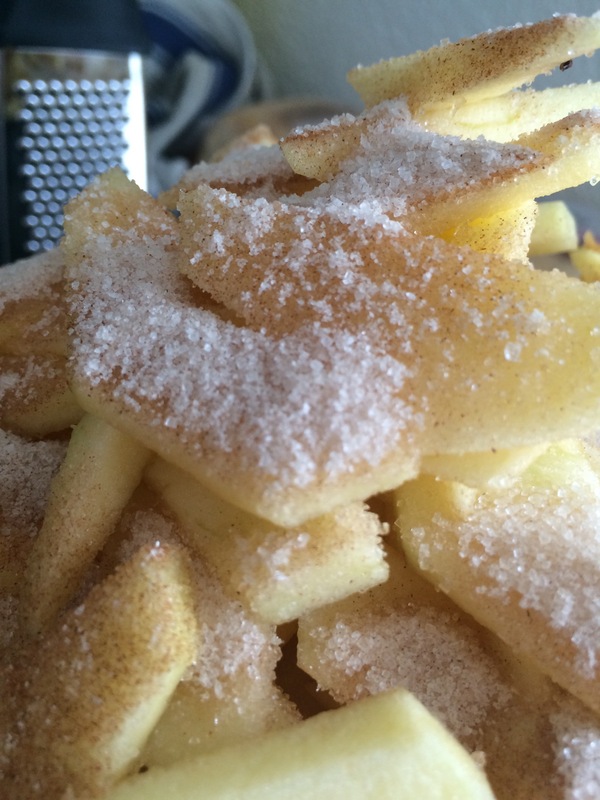 Once you have cut the apples sprinkle the cinnamon and sugar over them. Spread a large clean table cloth or sheet over a large table. You will see from my pictures that my table was too long for this. I would say that a regular square table will be fine. 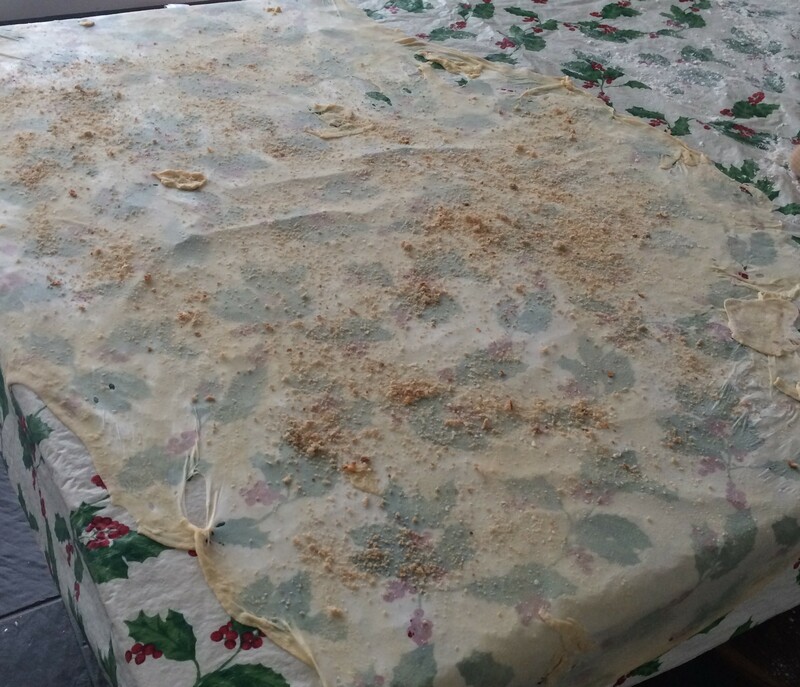 Sprinkle the table cloth with flour. The dough will still have some “stick” to it, so have some flour handy. 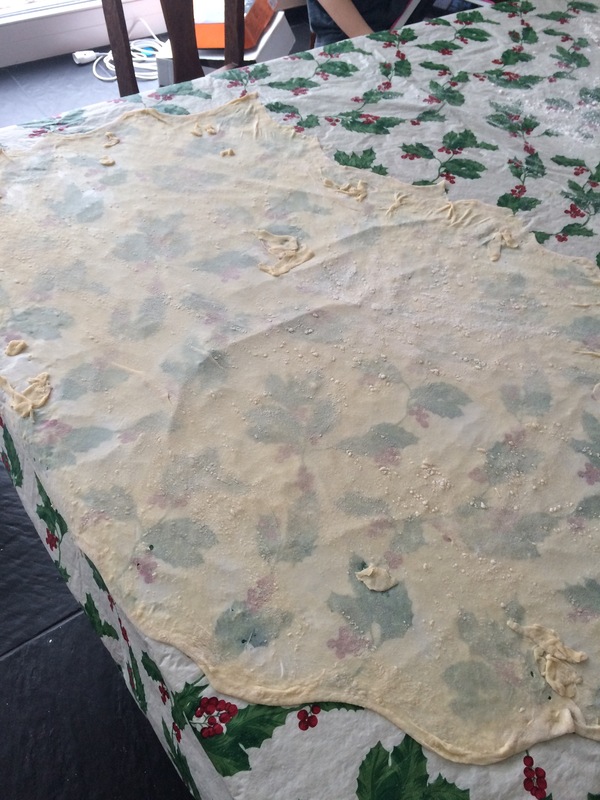 Roll out the dough right onto the table cloth until it is a thin as you can get it. Then you will use the backs of your clenched fists to gently pull it even thinner, moving around the table as you do so. Don’t worry if it rips. Cut off the thicker parts at the edges and use them to patch your holes. This is as big as my dough, that started as the size of a grapefruit, got. You can see the table cloth pattern with no problem. Preheat the oven to 400F and generously grease a baking sheet. Now you are going to sprinkle those bread crumbs over the dough. It’s odd, but it helps to soak up the liquid from the apples. Now you’re going to take all those apples you painstakingly sliced (and the boozy raisins if you’re using them) and you are going to spread them over 2/3rds of the dough. Dot the softened butter around the apples to keep them juicy. Now for the main event! Rolling up the strudel! Stand at the head of the dough where the apples start. Fold the edges of the dough on your left hand and right hand over the apples. 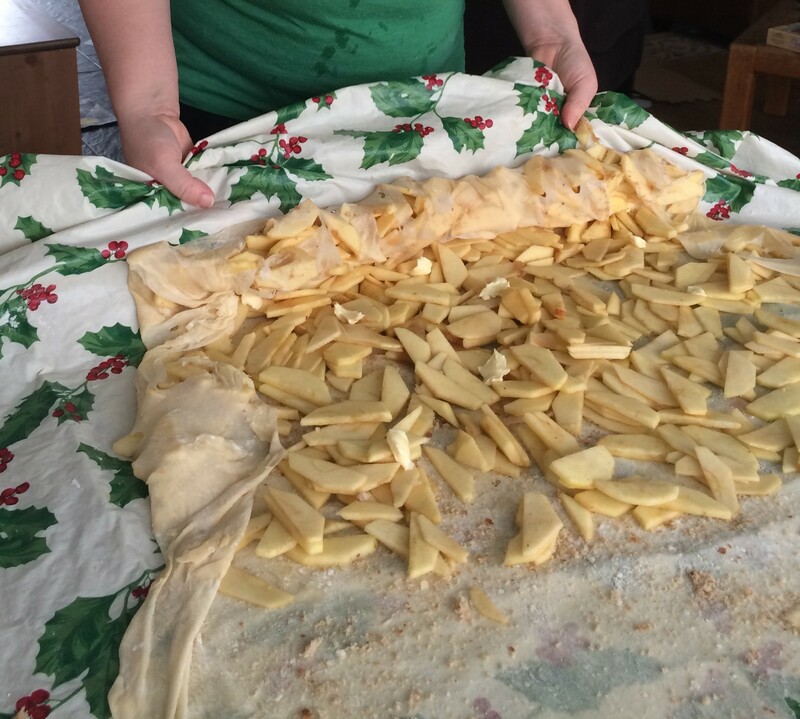 Then you are going to use the tablecloth to help you ever-so-gently start to roll the apples and dough together. You can see a big rip right near the bottom. If this happens to you don’t panic. You have a lot of rolling to do and it is going to cover that rip with no problem. You can see how I’m not even touching the dough. I’m literally pulling on the cloth to help the dough evenly roll onto itself. And here it is all rolled up! Now to find a baking sheet big enough for it. Hmmm…. Your tablecloth also comes in handy when it’s time to move this behemoth to the baking sheet. I wrapped mine in foil and sprayed it with non-stick spray. You might need help getting on the tray. I had E here to help keep the tray still while I got the strudel into place. Then take the melted butter and a soft pastry brush and, again, very, very gently brush the entire strudel with butter. Then pop it in your oven and bake for 45-55 minutes. Thar she blows! It’s Moby Strudel! 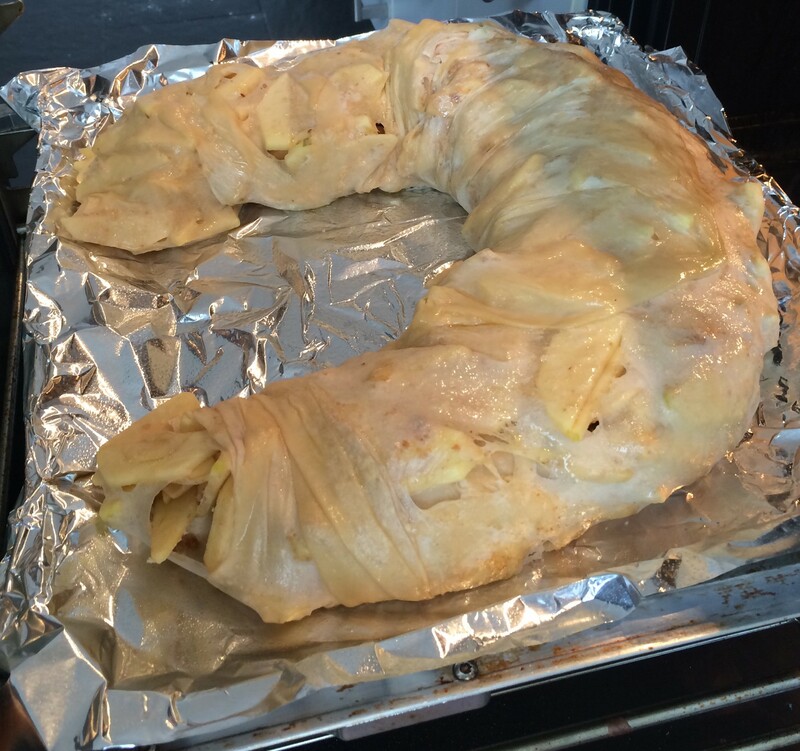 At about 15 and 35 minutes in you should baste your strudel with more of the melted butter. I have no idea why, but it’s butter so I’m not asking any questions. Crisp! Golden! And it smells heavenly! Lightly (or generously) dust this bad boy with powdered sugar and enjoy with the beverage of your choice! 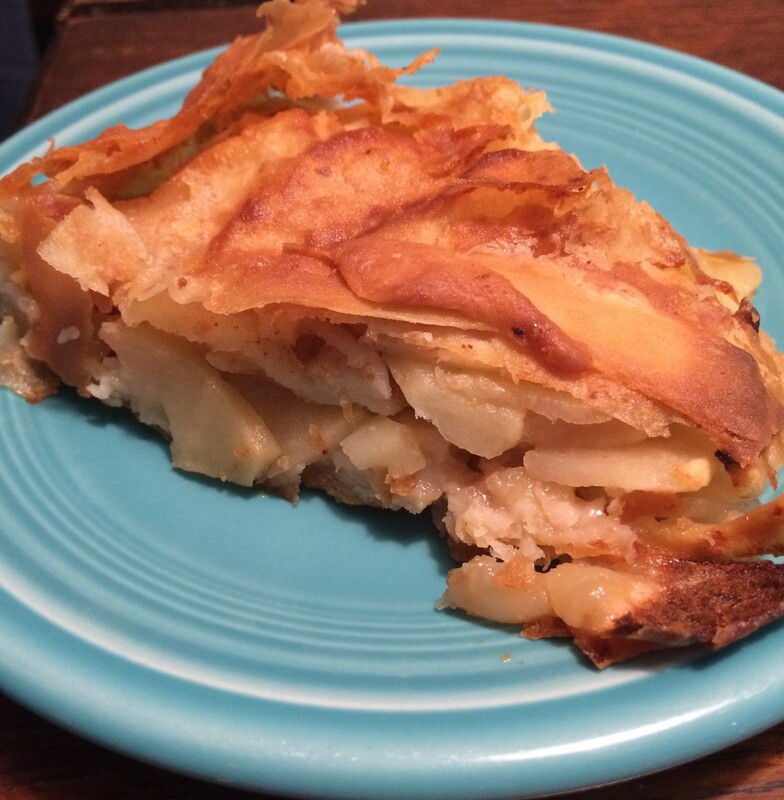 It’s got layers of apple goodness and a nice crunch to the outer layer. I think that perhaps next time I might not pull it quite so thin, but there were absolutely no complaints at dessert tonight. And it was actually pretty easy. 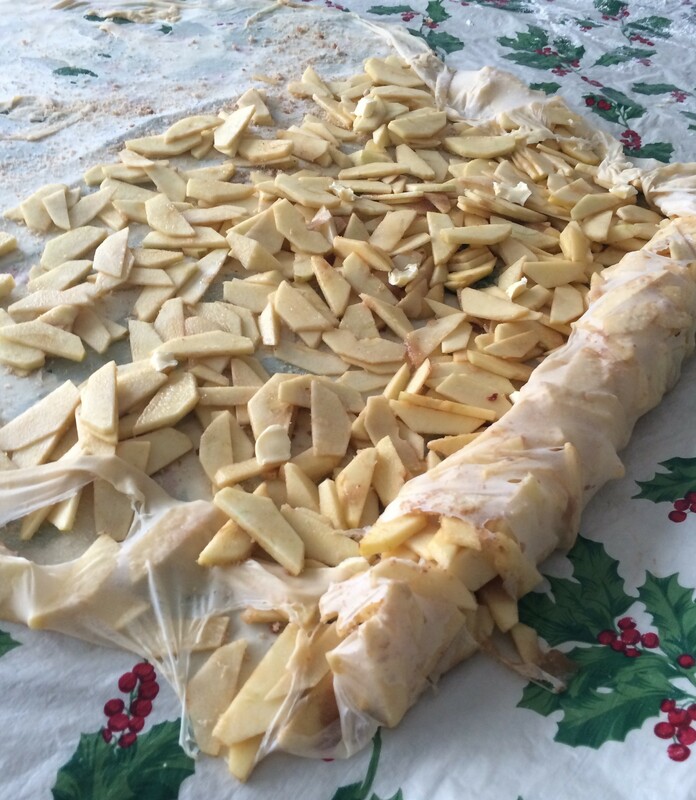 The most time consuming part was the slicing of the apples and the baking time. If you have minions to help you out the time it takes won’t be that bad. As it happens, I was watching Pirates of the Caribbean while I did all this so the time passed very quickly. This is actually very doable and your family will think you are a hero. I encourage you to channel your inner Julia Child and give it a try. The Swiss Family Carlson goes to a Farm! !